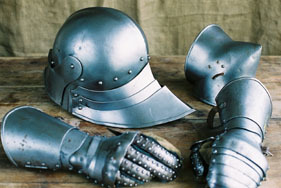 A display focusing on armour, weapons and surgery of the late 15th century of the type which would have been used during the War of the Roses. Aimed at students studying the War of the Roses or Henry VII in more detail. Age group : A level or As Level, 16 up. Display time: Roughly 1 hour, which can be split into 15/20 minute slots and interspersed with the teachers own lesson or if desired and if the number of students is large the 1 hour display can be repeated several times in a day. 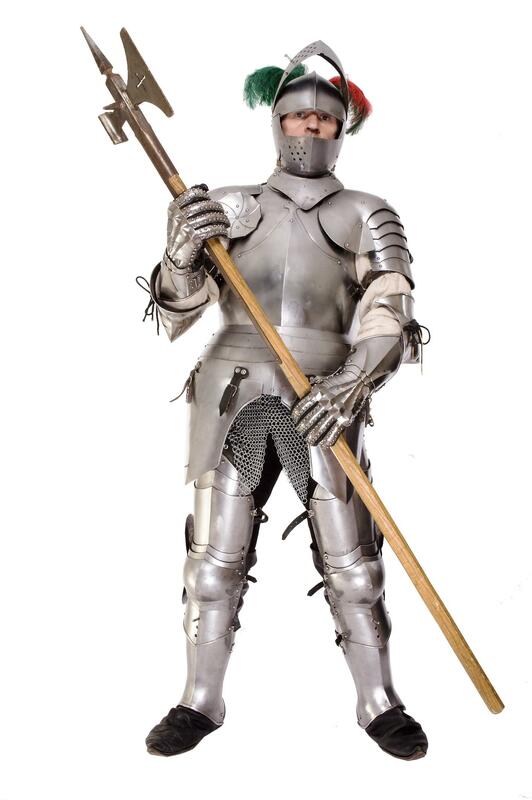 In this section, we talk through the development of armour since the beginning of the medieval period. How & why it developed, until it reached its pinnacle in the late 15th/early 16th Century. We talk about where it was made and who made it. What it weighed and what it cost. One student is dressed in armour and the other students will have the chance to handle pieces of replica armour. We look at some of the various different weapons of the 15th C, including various types of sword including the long sword, the falchion, the pole axe and the longbow and demonstrate how they were used with great skill to kill. The pole axe was the knights weapon of choice, capable of nearly cleaving a man in two, with an axe, hammer and spear it was a formidable weapon which could be used in many different ways. If time permits students may handle some of the swords (all blunt edged practice swords). Every King would take perhaps 15 or more surgeons or physicians with him when he went on campaign to treat the injured. Medieval surgeons did not have a great knowledge of anatomy and were not even aware that the heart was a pump. In this section we demonstrate how an amputation was undertaken, treatment of toothache with the pliers or a hot needle (for treating tooth worm), trepanning (cutting a hole in the skull), blood letting (we bring along live leeches to show), arrow extraction and much more. 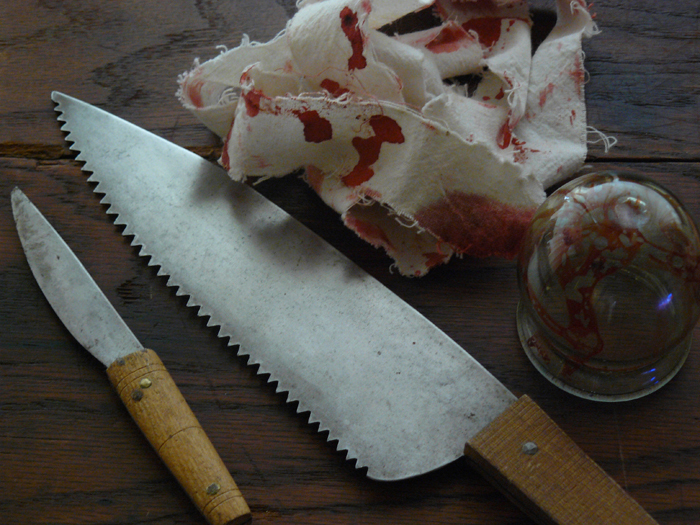 We also look at what damage a medieval weapon could do to a human body through photographs of some of their victims.